MAHA 2016 is THE EVENT that we gardeners and everyone else with interest in the agriculture industry are looking forward to. The theme of MAHA 2016 is "Our Food Our Future". MAHA 2016 is held on 1-11 December 2016. On directions how to to to MAHA 2016, please go to the bottom of this post. The venue is MAEPS (Malaysia Agro Exposition Park Serdang), a 100 hectare facility owned by Ministry of Agriculture and Agro-based Industry. MAEPS is located very near to Putrajaya, Malaysia's administrative capital. It is also midway between Kuala Lumpur and KLIA. Don't worry you won't go hungry as there are plenty of choices. Food trucks (picture above) are parked at strategic locations. There are many many food stalls at the indoor FOOD EMPIRE serving 168 types of exotic Malaysian state favourites. There are also F&B stalls at the outdoor Show Grounds, Indoor Pavilions and 14 State Pavilions showcasing each of the different states unique food and culture. There will be cooking demonstrations and food tasting at the indoor as well as outdoor exhibition areas. at the Floriculture Showground aka Floral World (Laman Florikultur). Stingless Bee Honey (Madu Kelulut) is branded as "Malaysia's super food" and promoted at MAHA 2016. All about figs at the "Laman Figs" near the MAHA Secretariat office. There are fig plants, fertilizers and soil mix for fig plants, figs fruits and fig products. Youths having fun while biking at MAHA 2016. Accommodation for glamping at NAFAS cube. Rooms include air-conditioned culvets and cabins with reception, minibar, washrooms and surau. The place overlooks a tranquil lake with nice scenery and one can go fishing too. These rooms are not just a temporary feature of MAHA 2016 but are permanent and anyone interested to rent them can contact NAFAS. A booth at the Fisheries Showground (Laman Perikanan). Anyone interested to try scooping some fishes to bring home? There are fighting fishes for sale, exhibition of blue tuna, freshwater fishes, live fishes, lobsters, fishing boats, exhibits of a giant whale skeletons found at Malaysian shores at the Kingdom of Sharks and the upside-down Inverted Fisherman's House for photography. Look out for the many types and varieties of vegetables, herbs, fruits and gourds. One cultivar is called "Upin Ipin" - try to find it! 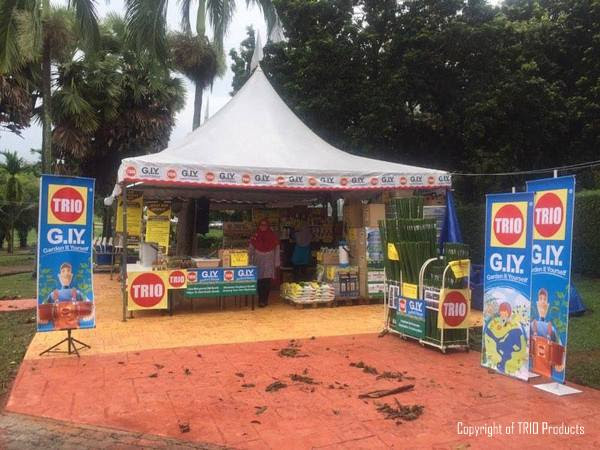 TRIO GIY (Garden-It-Yourself) products eg. seeds and mushroom starter kits. There are also other gardening DIY booths here. For Gardening enthusiasts wishing to go to Garden District to look at Garden Vegetables and Herbs related products, you need to get take the Green Route C Tram. 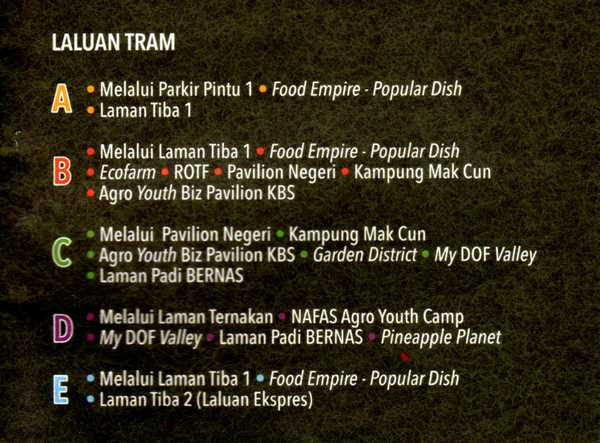 The Green Route C tram goes to the following locations: State Pavilion (Pavilion Negeri), Kampung Mak Cun, Agro Youth Biz Pavilion, Garden District, My DOF Valey (Fisheries/Laman Perikanan), Paddy Showground (Laman Padi BERNAS). If you are at Gate 1 or Gate 2 entrances, you can take the internal RapidKL shuttle bus Route E (Laman Tiba 1-Dewan Food Empire-Laman Tiba 2) and thereafter change to Green Route C Tram. If this is confusing, you can find MAHA 2016 volunteers in uniform at Gate 1, Gate 2 and each tram stop to help you get into the correct one. Route A (orange), B (red), C (green), D (purple) and E (blue). Get into the correct bus/tram to go to your intended destination. There is a huge garden bazaar and multiple stalls selling fresh farmers produce, plants and cuttings near the Gate 1 (Laman Tiba 1) and Gate 2 (Laman Tiba 2). The Castle of Fruit sells fruits and fruit juices, snacks and biscuits as well as organic corn. 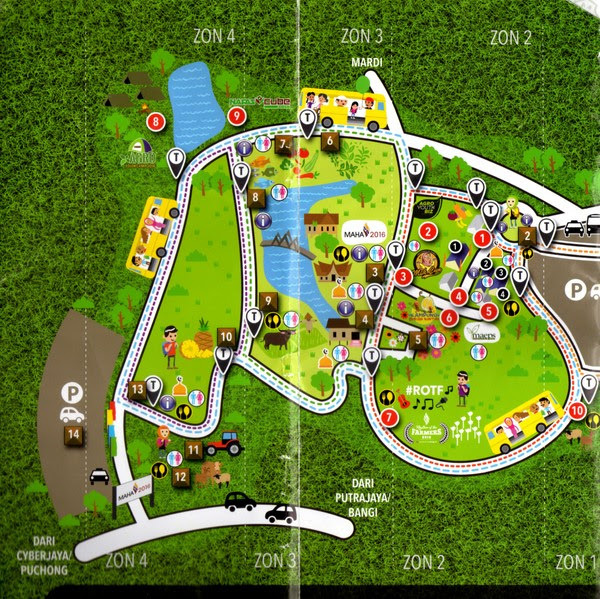 By CAR : Visitors can enter via Gate 1 (Hospital Serdang way) or Gate 2 (SKVE) way. When using Waze, just type "MAEPS Serdang" or "MAHA 2016". By Public Transport: FOC shuttle service of Rapid KL buses at bus terminal opposite Serdang KTM train station, UPM and at IOI City Mall Putrajaya. If you are coming by car, you need to park at the allocated parking areas and thereafter walk towards the Entrance. There are about 7,000 parking lots. Parking fee is RM 5 per entry. Once inside, FOC "hop-in hop-off" trams, Rapid KL buses and tractor (yes carriage/tram pulled by a tractor!) are available to transport you to the designated locations. You can purchase the Visitors Guide (Panduan Pengunjung) at RM 1 or refer to the location maps put up on giant display boards near the main entrances. Plan ahead where you wish to visit first. This way, you don't have to waste time going to the wrong places. Check with the information counters which is the correct bus/tram (e.g. Route A, B, C, D or E) that will bring you to your intended destination. I usually go sight-seeing and taking photos first. When the weather is fine and sunny, I visit the outdoor showgrounds. If it rains, I will visit the indoor pavilions. Later, just before going home, I'll go shopping at the bazaars. This way I don't have to lug around the heavy stuff that I had purchased earlier. GOOD LUCK and HAVE FUN @ MAHA 2016!